Apply topical antiobitics on your kitty as directed by your vet. Topical antibiotics treat superficial bacterial and fungal infections on your kitty. If she develops an abscess, infected wound, eye or ear infection or other external infection, your vet will probably prescribe a topical antibiotic. Sometimes, topical antibiotics also are used to prevent infections in wounds. Topical antibiotics are either bacteriostatic and fungistatic, or bactericidal and fungicidal. The first kind stops microorganisms from growing and spreading, the other kills microorganisms. Different bacteria are vulnerable only to certain classes of medications. Fortunately, your vet has a whole arsenal of antibiotics at his disposal. 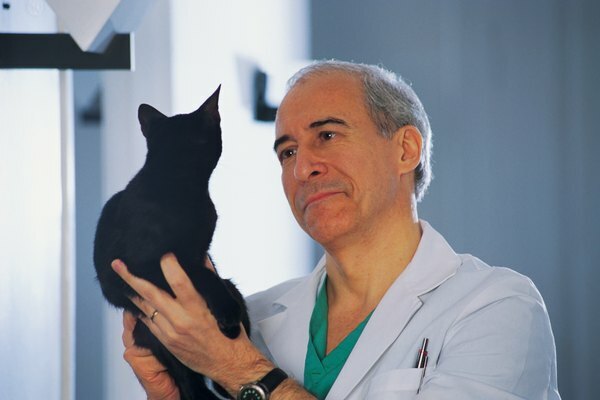 Common topical antibiotics for cats include amoxicillin and other penicillin-class medicines; azithromycin, erythromycin and other macrolides; cephalexin and other cephalosporin antibiotics; clindamycin, lincomycin and other lincosamides; doxycycline and other tetracycline-class medicines; and enrofloxacin, orbifloxacin and other quinolones. Some topical antibiotics are in creams or ointments for use on the skin. Others are in ophthalmic or otic solutions for ear and eye infections. How you use a topical antibiotic on your kitty depends on the type, location and severity of her infection. For abscesses that have spread deep into tissue or for other severe infections, your vet will probably prescribe an oral antibiotic to use with the topical product. Dosages and the frequency and duration of application also vary by type of antibiotic and other factors. Carefully follow the manufacturer's instructions and your vet's directions. Creams and ointments are generally rubbed directly onto the site of infection, often after gentle cleaning. Apply antibiotic eye drops right onto your kitty's eyes. Apply antibiotic ear drops into her ear canal. These are often used with an ear cleanser to ensure the antibiotic gets down into the ear to treat the infection. Topical antibiotics usually don't cause side effects. Your kitty might experience some minor irritation where you apply them. If she has had an allergic response to an antibiotic, she shouldn't get any other medication from that class. If the infection doesn't improve within a few days, consult your vet for a different prescription. The bacteria or fungus might not normally be susceptible to the first class of antibiotic, or it might be a drug-resistant strain. Never stop using a topical antibiotic before the prescription is fulfilled, just because your kitty looks better. Recurrence is likely if you do. Topical antibiotics frequently contain topical corticosteroids to give your kitty relief from symptoms such as inflammation and itching. This helps stop her from scratching and biting herself, which would make superficial infections harder to treat. Topical corticosteroids, which cause fewer and more mild side effects than systemic corticosteroids, soothe inflammation and associated irritation. However, they can cause temporary side effects such as thinning or tight skin and acne at the site of application.